Huh, just realised Omenspeaker isn't here either. I'd recommend looking through list of staples in your colors. Stuff like Eternal Witness and Cyclonic Rift are always good. You definitely need better ramp and more card draw. 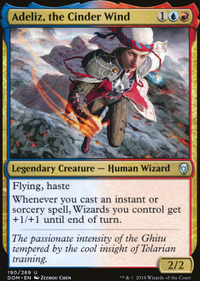 Cards that fill that role and could suit your deck well are Rishkar, Peema Renegade, Cultivate, Mystic Remora, Blue Sun's Zenith, Beast Whisperer, and Soul of the Harvest. I would also recommend adding some more token generators, because small tokens synergize specially well with your commander: Chasm Skulker, Hornet Queen, Hangarback Walker, or, a personal favorite, Fable of Wolf and Owl. You should also consider adding more single target removal. Cards like Pongify or Rapid Hybridization are great for getting rid of big threats and for popping off your own cards like in case of them being exiled. There is no better feeling that responding to a Path to Exile targetting your Hangarback Walker with ten +1/+1 counters with your own Pongify. In case you have trouble wondering what to cut I'd recommend taking out the worst mana producers, Biomantic Mastery, Snakeform, Infiltration Lens, Augury Owl, Omenspeaker, Overrun, and Give / Take. 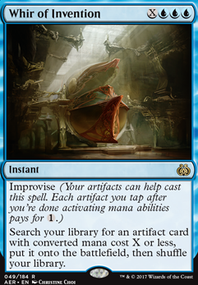 Maybe even one to three lands given how low your curve is and how much card draw you can generate. I hope this helps. I like this. Obviously it'll play fast, but do you have any concerns over not having any bombs that don't require you to build them to be bombs? 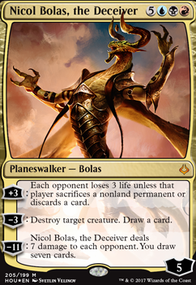 I'm interested to try something like this but with Niv-Mizzet, Parun in place of the Omenspeaker. Obviously it removes some of the speed, but better utilizes all the card draw. I'm curious to see how it does around him. Why not Millstone? It's in M19, so it's standard legal. Also, I would go with about 2 extra land and more counter spells. Two additional land to power cards like Mill Stone and Surge Mare. To make room, you can cut back a bit on creatures, then add cards like Essence Scatter and Negate. I disagree that Tempest Djinn has no place in a mill deck-- you need another way to win. However, I don't think your deck needs more creatures. Rather, I think you can trim Wall of Mist and either (both?) Omenspeaker or Dimir Informant. Oh, a less expensive (money cost, not mana cost) version of Mission Briefing is Flood of Recollection. It's sorcery speed instead of instant speed, but same mana cost and does the same thing. It also only costs pennies. Cool deck idea! +1 from me! I've been working on a similar deck so I do have a few ideas. First and foremost Tempest Djinn doesn't belong in a mill deck. As your mono-blue a couple Memorial to Genius can't hurt. 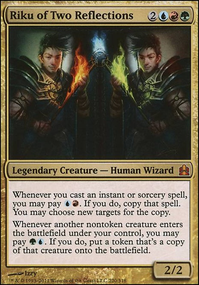 Generally Negate and Essence Scatter I'd keep to the sideboard and replace it with a seasoning to taste of your favorite Cancel variant, Syncopate, prison type enchantments,and bounce spells. 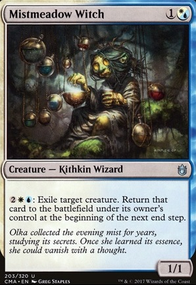 Speaking of bounce spells I'd look into ones that can target all nonland permanents such as Blink of an Eye first it's always nice to have that option and second this standard is going to have allot of enchantment destruction mainboard in the form of Assassin's Trophy. Mission Briefing is a card to look at setting up your next draw and reusing a spell in your graveyard. You may not be interested but there is a combo involving Drowned Secrets, Naru Meha, Master Wizard, and Release to the Wind. 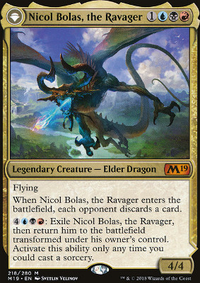 Even without the combo release could be worth looking at if you have a number of ETB effect such as Homarid Explorer or Omenspeaker & Dimir Informant which do decent wall impressions but also help set-up your draws which shouldn't be overlooked.